Come and learn about a very interesting life, vision, teachings, and mission of Rev. Dr. Sun Myung Moon. 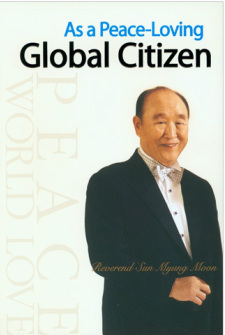 "As a Peace-Loving Global Citizen," published by The Washington Times Foundation. A best-seller in South Korea, the book, now translated into English, gives Western readers an opportunity to learn more about a man whose deeds and goals have been the subject of international attention for decades. In the book's foreword, the Rev. Moon writes about his wish to "bring about a world of peace" but adds that his pursuit of that goal over a long life has not been without setbacks. He writes, "I am a controversial person. ...The world ... has associated many different phrases with my name, rejected me and thrown stones at me." He adds: "I have been unjustly imprisoned six times in my life - by imperial Japan, in Kim Il Sung's North Korea, by South Korea's Syngman Rhee government, and even in the United States - and at times I was beaten so hard that the flesh was torn from my body. Today, though, not even the slightest wound remains in my heart." Nevertheless, he notes, "Recently, a growing number of people have been seeking to know more about me. For the sake of those who are curious, I have looked back on my life and recorded my candid recollections in this volume." 18 pages of photos have been added to the 2010 English Edition.